Worried about dinner tonight? I’ve got you covered. This one will get you over the weekly hump and carry you through to the weekend. Promise. 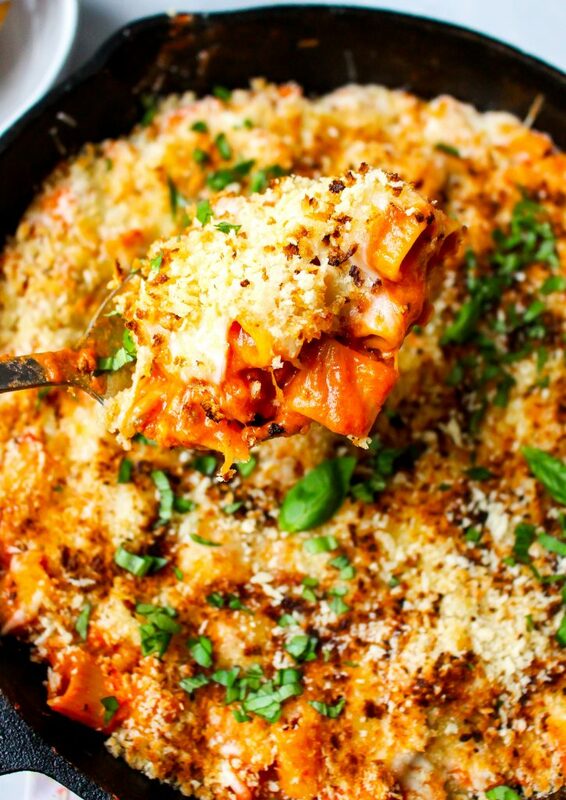 This one-pot pasta skillet is LOADED with flavor and it only takes 30 minutes to put together. So not only are you putting a hearty and completely satisfying meal on the table in a half hour, but you’re left with ONE PAN to clean when all is said and done. Except it does. Because this loaded skillet has pasta, creamy marinara, parmesan, and bites of tender chicken…all blanketed in a cheesy, crispy layer of breadcrumbs. It is glorious. I love serving pasta dishes like this with a simple side salad to keep things balanced and easy. I love chicken parmesan. I do NOT love making it, though. I dread any recipe that requires me to bread and then pan fry chicken, which makes my consumption of chicken parmesan a restaurant-only experience. I can probably count on one hand the number of times I’ve made it at home. And I’ve been cooking for a LONG TIME. This pasta solves that problem for me! Instead of breading the chicken and then cooking it in oil until crisp, we’re sautéing it and then tossing it with a bunch of pasta and sauce and cheese. It all cooks together until the flavors love on each other and the house smells like heaven on earth. 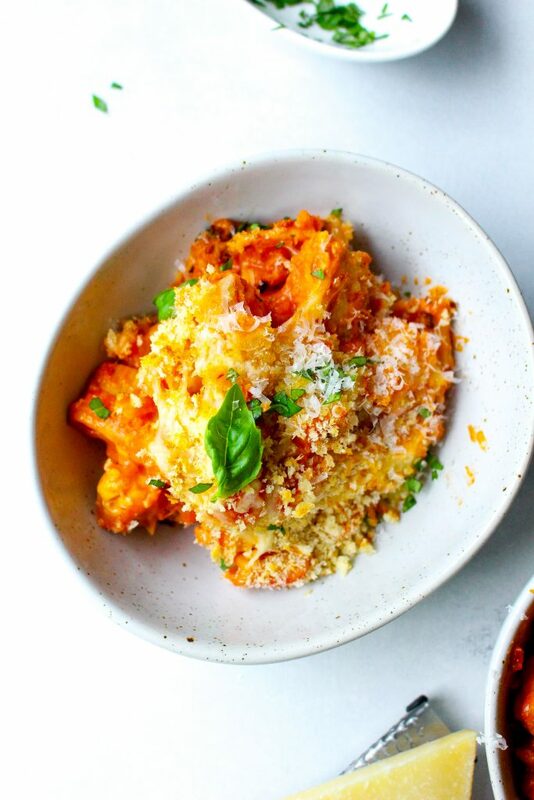 It’s all the flavor of chicken parmesan with none of the fuss! 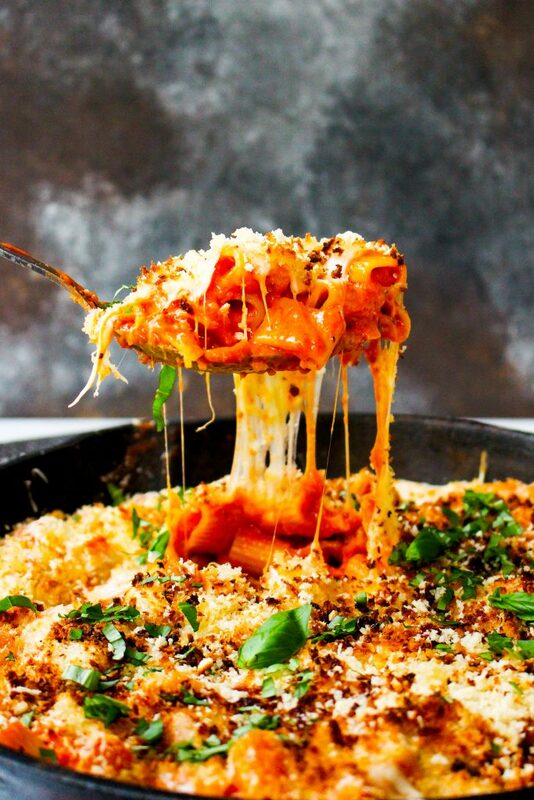 Even the pasta cooks in the same pan. No boiling or draining pasta water! Easy peasy is the way to go here. Another thing I love about this meal? It feeds our little family for at least two nights, sometimes three. And if that doesn’t scream “winning” from the rooftops, I don’t know what does. It truly gets me through the week. We are so, so guilty of not eating our leftovers. I hate wasting food, and often times, when I make large-batch meals, we end up throwing some of it out at the end of the week. Total bummer. 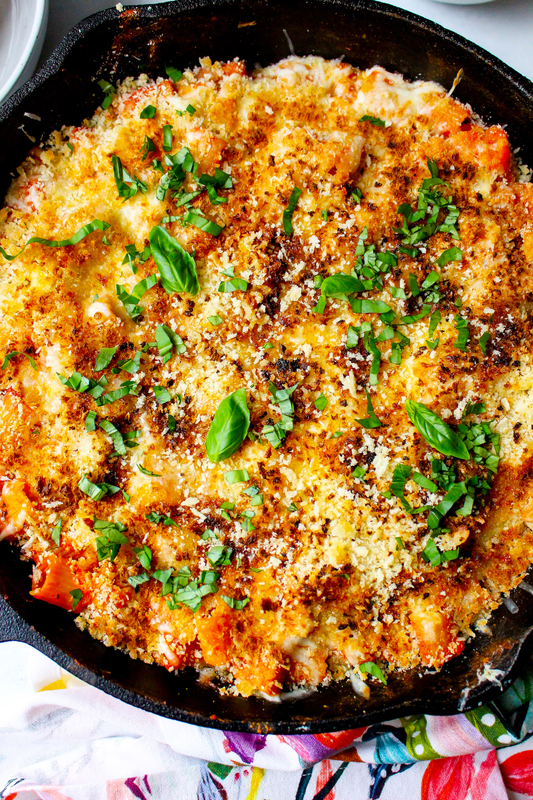 But this pasta skillet barely made it to day two! My husband loved it. My son loved it (and he doesn’t like anything. For real. Hah.). I loved it. Especially with an icy cold glass of chardonnay. Heat the oil in a large skillet or Dutch oven pot over medium-high heat. Season the chicken with salt, pepper, and the oregano and add to the hot oil. Cook for 3-4 minutes, tossing frequently, or until the chicken is cooked through. Remove the chicken from the pan and set aside. Reduce the heat to medium-low and add the garlic, shallot, and red pepper flakes to the skillet. Cook for a couple minutes and then add the tomato paste and mix it in until it is melted. Stir in the marinara, milk, and water. Bring the mixture to a simmer and then add in the pasta. Cook, stirring frequently, until the pasta is tender and the entire mixture has thickened, about 12 minutes. Meanwhile, preheat the broiler in your oven. Return the chicken to the pan and toss to combine. 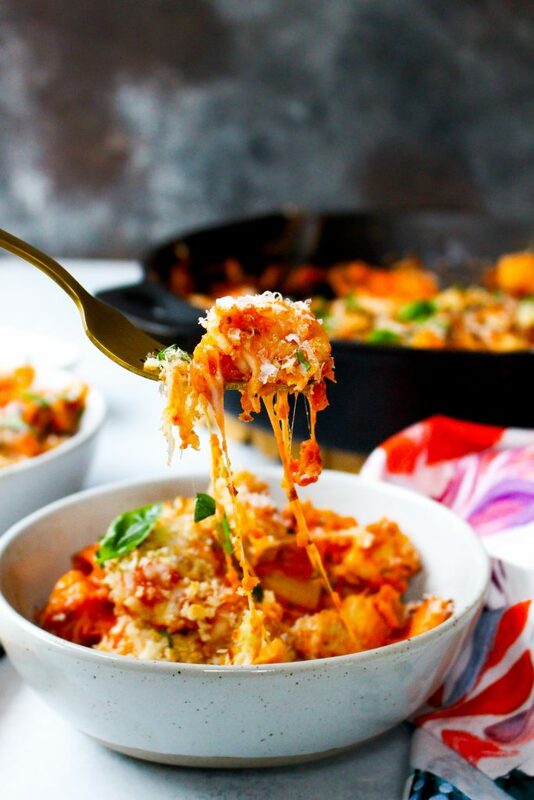 Stir in half of the mozzarella and parmesan cheeses. 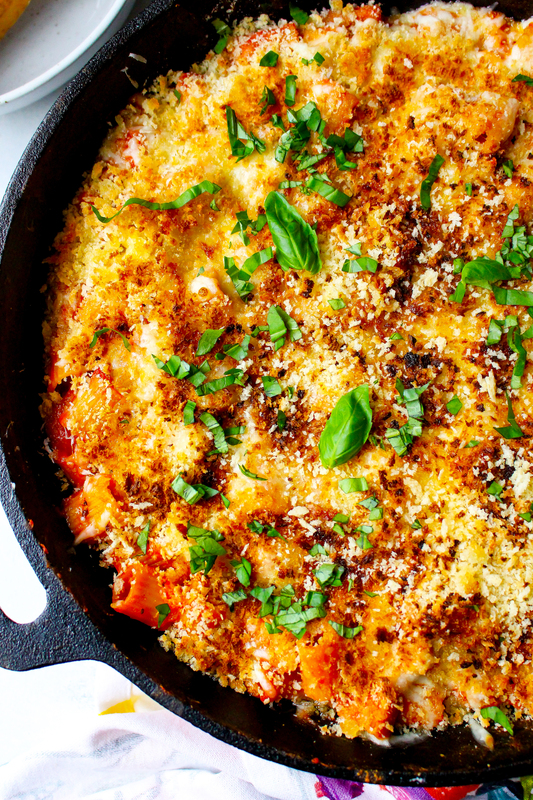 Top the skillet with the remaining cheeses and the panko breadcrumbs. Drizzle lightly with oil and then place the skillet under the broiler for about 1-2 minutes, watching it carefully. It is ready when the top is bubbly and brown. Allow to cool slightly before serving. Garnish with basil and additional parmesan cheese, if desired. 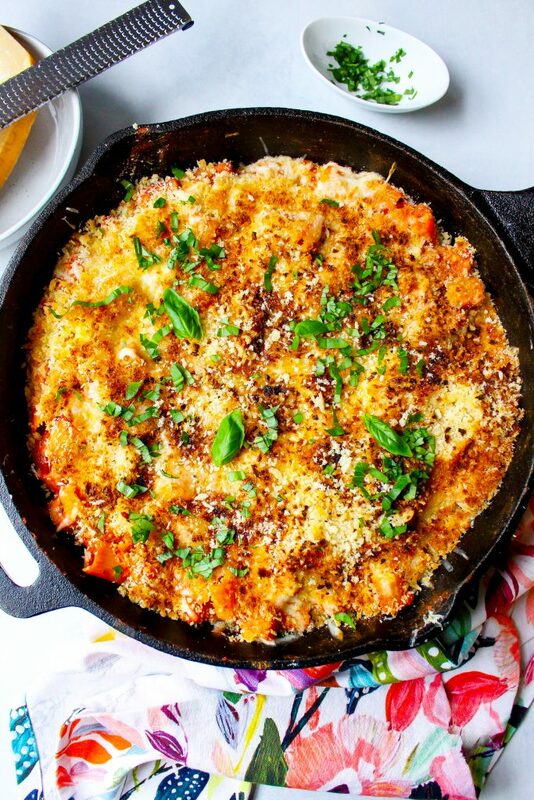 Could you clarify the amount of pasta/penne recommended for this recipe? Recipe indicates 16 ounces or half a standard box. I find that the standard box of pasta/penne is 16 ounces. Half a standard box would be 8 ounces or a full box would be 16 ounces. Getting this right would be critical to the recipe which I am hoping to make for the first time this week!! Looking forward to the yummy flavors! Hi Michelle! Totally a typo on my end! It is half of a standard 16-oz box (so 8 oz pasta total). So sorry for the confusion! I’m updating the recipe now. I hope you enjoy this recipe as much as we do!